Complicated dynamic behavior will happen while nonlinear four degree-of-freedom (DOF) semi-vehicle model is under irregular road excitation. The complex nonlinear vibration influences the ride comfort and safety. 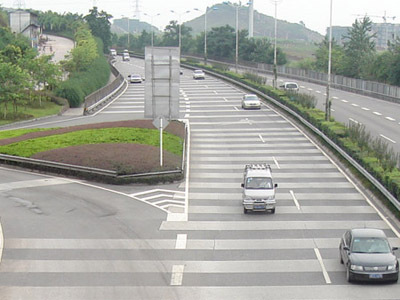 In this paper, the study is aimed at analyzing the chaotic vibration and comfort analysis of a vehicle passing the consecutive speed control humps (SCHs). A four-DOF half-vehicle model and combined sine-trapezoidal wave of variable frequency are applied. Occurrence of chaotic vibration is analyzed by bifurcation diagram, time history, Poincarée map. The numerical simulation results show that chaotic vibration phenomenon possibly appears as vehicles are driven on consecutive SCHs. In addition, the exact range of vehicle speed that results in chaotic vibration is derived. Further studies indicate that the influence of quasi-periodic motion state to vehicle on driving comfort is the biggest. This paper uses direct variable feedback control method to control chaotic vibration, and analyzes the control effect from the feedback gain control effect and the delay of the feedback control. The results will help dynamic characteristic analysis of vehicles and the design of the continuous speed bumps. Z. Yang, S. Liang, Q. Zhu, Y. Sun, and S. Zhan, “Chaotic Vibration and Comfort Analysis of Nonlinear Half-Vehicle Mode Excited by Consecutive Speed-Control Humps,” J. Robot. Mechatron., Vol.27, No.5, pp. 513-519, 2015. S. Liang, C. G. Li, Q. Zhu, and Q. Y. Xiong, “The influence of parameters of consecutive speed control humps on the chaotic vibration of a 2-DOF nonlinear vehicle model,” J. of Vibroengineering, Vol.13, No. 3, pp. 406-413, 2011. Q. Zhu and M. Ishitobi, “Chaos and bifurcation in nonlinear vehicle model,” J. of Sound and Vibration, Vol.275, No.3, pp. 1136-1146, 2004. M. Bouazara, M. J. Richard, and S. Rakheja, “Safety and comfort analysis of a 3-D vehicle model with optimal non-linear active seat suspension,” J. of Terramechanics, Vol.43, No.2, pp. 97-118, 2006. G. Litak, M. Borowieca, M. I. Friswellb, and W. Przystupac, “Chaotic response of a quarter car model forced by a road profile with a stochastic component,” J. of Chaos, Solitons and Fractals, Vol.39, No.5, pp. 2448-2456, 2009. O. Abaza, Z. Hussein, and I. Malto, “Optimization of Speed Control Hump Spacing,” J. of institute of transportation engineers, Vol.82, No.1, pp. 44-47, 2012. W. Wang, G. X. Li, and Y. L. Song, “Study on hyperchaotic vibration of whole vehicle dynamic model via time-delay power of four wheels,” J. of Vibration and Shock, Vol.28, No.3, pp. 102-106, 2009. B. Anti’c, D. Pevsi’c, M. Vujani’c, and K. Lipovac, “The influence of speed bumps heights to the decrease of the vehicle speed – Belgrade experience,” J. of Safety Science, Vol.57, pp. 303-312, 2013. W. Nobutaka, T. Akihiro, S. Masami, and N. Masaharu, “Vehicle yaw control using an active front steering system with measurements of lateral tire forces,” J. of Robotics and Mechatronics, Vol.23, No.1, pp. 83-93, 2011. Z. Y. Yang, S. Liang, Y. S. Sun, and Q. Zhu, “Chaos of a nonlinear half-vehice suspension system excited by the consecutive speed-control humps,” J. of ICIC Express, Vol.7, No.11, pp. 3163-3168, 2013.